Growing Up. 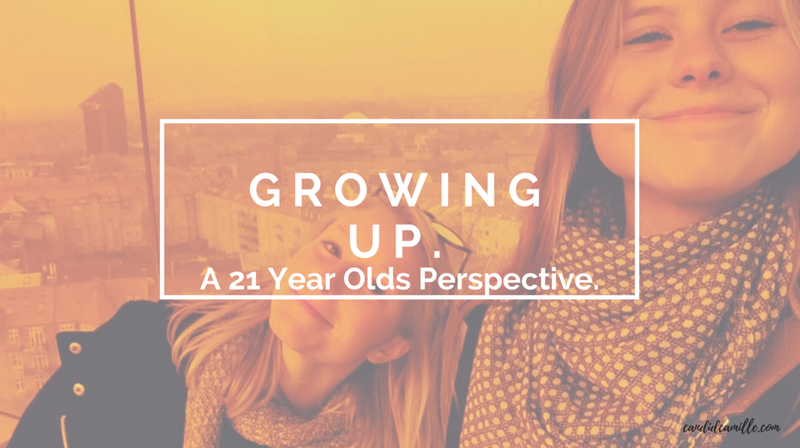 A 21 Year Olds Perspective. "You don't stop being a kid when you grow old, you grow old when you stop being a kid"
This is one of my absolutely favorite sayings. My dad shared this with me some years back, I have absolutely know idea if it's his own little saying or if he heard it somewhere else, but I love it. It's one that has really stuck with me and has done a lot for shaping who I am today. When we are young, most of the time we are always wishing to grow up and be an "adult". Then when we "become adults", it cool and fun. For a second. Then all of a sudden we want to go back to being kids again. This desire to be a kid again, seems to carry on as the years go on, for most people. Then there are the people who embracing being a grown up but also embrace the child at heart. This is the type of person I want to be and since understanding that, I feel as though I have embraced this way of life and hope to continue to, for many years to come. I sometimes catch myself saying things that make me sound incredibly old. Such as "they are so young why are they doing this", "they are so young why are they wearing that", or "what are they in a rush for, they should just be enjoying being the age their are now". How old do I sound?! Right? It's a bit hilarious, considering I'm only 21 - so I myself, even though I have all my grown up responsibilities, am still a child. Like definitely still a child. Maybe that's why I feel as though I am able to find this balance between childhood and adulthood. I'm not sure, but I've decided to roll with it. So this a public service announcement, for everyone, whether you are 16, 21, 35 or 68. Embrace the responsibilities that come with going through the circle of life but more importantly remember to embrace that inner child. Embrace your inner child, no matter how old you are, how many kids you have, what job you have, or how many years you have lived and experienced. What really matters is finding joy and happiness in the little things and thats exactly what children are amazing at. Believe it or not, but we can actually learn a lot from the children in our lives and they should always be a reminder to take a deep breath, chill out and just be a little childish sometimes. Whether that be watching Disney movies, coloring, or playing with LEGO's on the floor. So don't stop being a kid just because you are growing old. Use growing up as an excuse to just take a step back from the "grown up life" and just enjoy the simplest of things. Whether that be alone, with your friends, with your family, with your children or with your nieces and nephews. Life is short, embrace and love all it's little moments.